NEW ORLEANS — The New Orleans Pelicans might present a big problem for the Houston Rockets. Actually, make that two big problems, both of whom were planning to head to another All-Star Game. Anthony Davis and DeMarcus Cousins give a lot of teams trouble. But the Pelicans’ potent big duo is particularly problematic for a Rockets squad built to play fast and fire away from the perimeter. That was evident during the Pelicans’ 115-113 win over the Rockets on Friday night. Cousins turned in a dominant performance despite early foul trouble, recording his second triple-double in a span of three games with 15 points, 13 rebounds and 11 assists. Using his 30-pound weight advantage, Cousins often overpowered Houston center Clint Capela, including a crucial putback while drawing a foul with 15 seconds remaining. 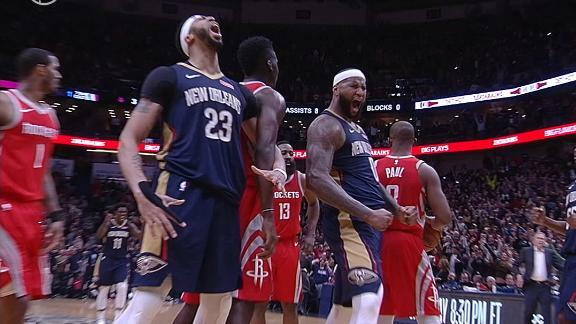 The Pelicans outscored the Rockets by 16 points in Cousins’ 30 minutes. But Cousins left the game with an apparent lower left leg injury after missing the subsequent free throw and going for an offensive rebound. He did not return after being helped off the court, putting no pressure on his left leg. Davis finished with 27 points, 11 rebounds, five assists and five blocks. He carried the Pelicans while Cousins sat after picking up two fouls in the first four minutes, scoring 16 points in the first quarter. Davis’ dominance makes it difficult for Houston coach Mike D’Antoni to keep sharpshooting power forward Ryan Anderson on the court. Anderson went scoreless in 14 minutes in the loss, with Houston getting outscored by 20 points with him on the court. New Orleans’ bigs spoiled a spectacular performance by two former New Orleans players who still get booed when they return to the Big Easy. Rockets guard Chris Paul, who pushed for a trade more than six years ago from the franchise then known as the Hornets, had 38 points and eight assists. His scoring flurry of 10 points in the final 2:14 of the third quarter got the Rockets within striking distance after the Pelicans’ lead had swelled as large as 21 points. Pelicans fans reacted with glee as “Hit the Road, Jack” played when Paul fouled out with 1.8 seconds remaining. Houston sixth man Eric Gordon, the centerpiece of the package the LA Clippers sent to New Orleans for Paul in 2011, had 27 points on 10-of-15 shooting. Gordon, who joined the Rockets in free agency before last season, launched a few of his 3-pointers from the French Quarter. The rest of the Rockets, however, were cold from long range. Paul and Gordon combined to shoot 8-of-12 on 3-pointers; their teammates were 4-of-24. The two teams are now tied 1-1 in their regular-season series, with the home team winning both times. It remains to be seen whether Cousins will be able to team with Davis again for the next two meetings.